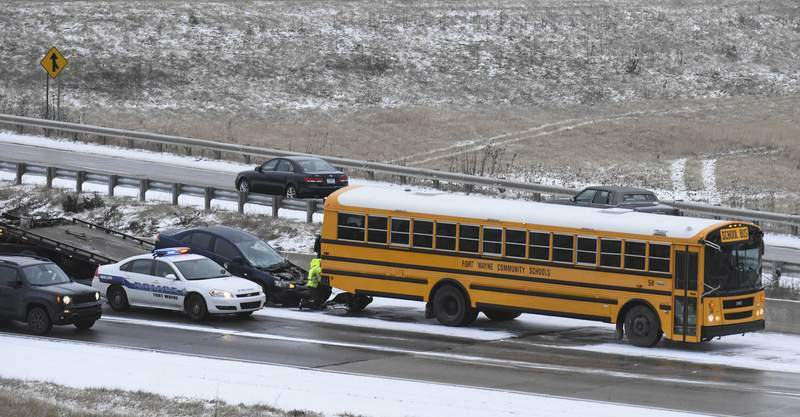 Michelle Davies | The Journal Gazette Authorities investigate Wednesday morning after a Fort Wayne Community Schools bus was rear-ended by a car on Coldwater Road. There were no students aboard, and the driver was not injured. Winter's first slick roads brought on numerous crashes Wednesday. It was unclear whether road conditions contributed to a crash Wednesday morning that killed one person when a car collided with a semi at U.S. 30 and Doyle Road in New Haven. The crash occurred about 8:30 a.m. and is under investigation, according to a spokeswoman at the New Haven Police Department. There were 33 reported crashes in Fort Wayne between 6 and 9 a.m., according to Michael Joyner, Fort Wayne Police Department spokesman. Ron Galaviz, public information officer for Indiana State Police in Fort Wayne, said troopers responded to six area crashes and one slide-off Wednesday morning. A Fort Wayne Community Schools bus was involved in a two-vehicle crash when a car rear-ended a school bus on Coldwater Road on Wednesday morning. The bus driver was just beginning her route and no students were on board, FWCS spokesperson Krista Stockman said. The bus driver was not injured. Snow on Wednesday morning was relatively light – less than an inch as of 1 p.m. – but the combination of cold temperatures with snow and moisture led to slicker roads, said Geoffrey Heidelberger, a meteorologist with the National Weather Service of Northern Indiana. Snow west and north of Allen County amounted to about two inches, Heidelberger said. The National Weather Service expects more snow Saturday. “We don't have an exact number. There's still a lot of uncertainties,” Heidelberger said. Galaviz said some stretches on Interstate 69 were slick. When troopers encounter slick roads, the ISP reports them to the Indiana Department of Transportation for treatment, he added. Galaviz had some advice for winter weather drivers: “Law enforcement always reminds people that snow and ice do not cause crashes. It's the way we drive in those conditions that cause those crashes.